Knizner, 22, is batting .271 with seven home runs, eight doubles, one triple, 24 RBI and 16 runs scored in 41 games. He has thrown out 36% of would-be base stealers, is slugging .469 and is the 2nd hardest player in the MWL to strike out at 9.16 plate appearances per K. Knizner is a native of Glen Allen, Virginia and was drafted by the Cardinals in the 7th round of the 2016 draft out of NC State. Young, 23, is batting .290 with nine homers, eight doubles, four triples, 32 RBI and 21 runs scored in 47 games. He leads the Chiefs in hits, home runs, RBI, total bases, OBP and slugging percentage. Young ranks third in the MWL with a .534 slugging percentage and fifth in HR/AB ratio. He is a native of West Fargo, ND and was drafted in the 37th round of the 2016 draft out of Indiana State. Trosclair, 22, is batting .276 with three homers, nine doubles, two triples, 23 RBI and 18 runs scored in 46 games. He is second on the Chiefs in walks and tied for second with Knizner in hits and doubles. A native of Sulphur, LA, Trosclair was drafted by the Cardinals in the 20th round of the 2016 draft out of Louisiana-Lafayette. O'Reilly, 22, is 3-1 with a 2.08 ERA and a 0.82 WHIP in eight games and five starts. He has struck out 39 and walked just three over 39 innings while holding opponents to a .207 average. He is second in the MWL in WHIP and eighth among starters in ERA. O'Reilly has the longest Chiefs outing of the season and most single-game strikeouts as he whiffed 10 over 8 1/3 innings in a one-hitter on May 20. A native of Wading River, NY he was drafted in the 27th round of the 2016 draft out of Flagler College. Hicks, 20, is 7-1 with a 3.54 ERA in 10 starts while striking out 40 and walking 27 over 53 1/3 innings of work. He leads the Chiefs with six quality starts and Peoria is 9-1 in his 10 starts. Hicks is tied for second in the MWL in wins and just outside the top 10 in innings pitched. A native of Houston, TX, Hicks was drafted by the Cardinals in the 3rd Round (Supplemental) of the 2015 draft out of Cypress Creek High School. 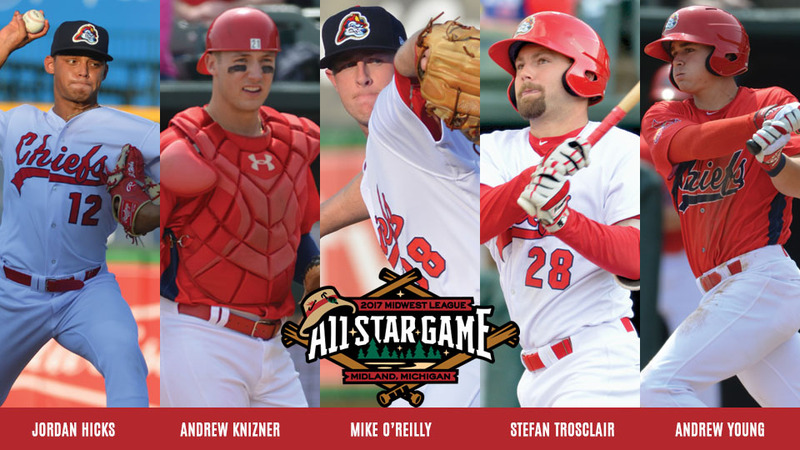 The 2017 Midwest League All-Star Game will take place in Midland, Michigan, home of the Great Lakes Loons on Tuesday, June 20. The Chiefs have the third most selections in the Western Division with five. Cedar Rapids and Kane County, who begin Wednesday in the two playoff spots, have six players each. Beloit, Quad Cities, Clinton and Wisconsin each have three players while Burlington has two. The Dayton Dragons lead the Eastern Division with seven selections while West Michigan has six. Lansing, South Bend and Bowling Green all have four selections while Fort Wayne has three. The host Loons have two selections while Lake County has just one.